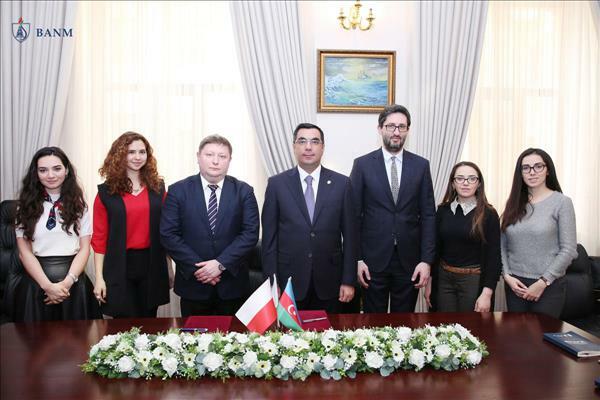 Representatives of WSB University (Poland) including Vice rector for International Cooperation Rafał Rębilas and Director of International Relations Paweł Urgacz visited Baku Higher Oil School ( BHOS ) and met with BHOS Rector Elmar Gasimov, managers and key staff members. At the meeting, spheres of cooperation between the Higher School and the WSB University covering student and staff exchange programs, exchange of scientific and didactic materials, and joint research and educational projects were discussed, and bilateral Cooperation Agreement was signed. It was also agreed that the BHOS MBA students would be provided with the possibilities of parallel studies at the WSB University and obtain a second diploma of the Republic of Poland in accordance with the chosen field of study after graduating from the Higher School. The Agreement on Cooperation signed at the meeting implies, among other steps, establishment of a joint scientific and methodical council consisting of leading specialists to harmonize educational plans and programs, and implementation of the distance learning program (E-learning) to the process of educating students of the University through the use of modern interactive technologies (primarily the E-platform). During the visit, the guests were given a tour around the BHOS campus, were acquainted with the conditions created for the students and were shown the lecture halls, training laboratories, the library and the sports complex.